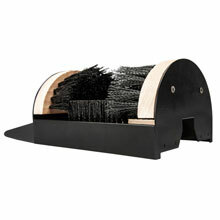 The perfect heavy duty work boot, shoe or footwear cleaning tool. 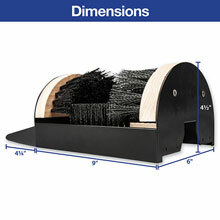 This scrubber, scarper and cleaner is ideal for use on the job site, garage, patio and more. 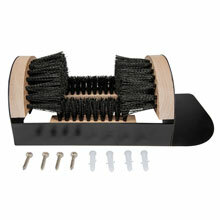 Heavy duty molded plastic brushes, weatherproof hardwood and an iron framework be long lasting from the elements of snow, rain or weather. 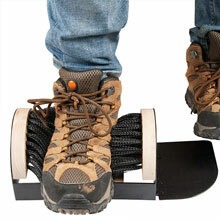 Perfect for travel with the fold down stationary foot plate or mount using the four included anchors and screws for a more permanent placement. 9¼ wide, 6" deep, 4½" high. 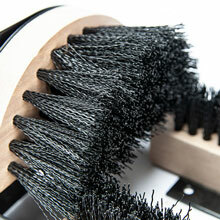 •PRACTICAL DESIGN: 3-in-1 scrubber, scraper, and cleaner, the strong textured polymer brush bristles remove mud, snow, dirt, rock, gravel, sand, leaves, and debris from tacking into your home or work. 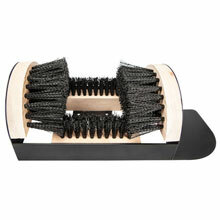 A triple brush base provides quick removal of dirt and far surpasses single brush other shoe scrapers. 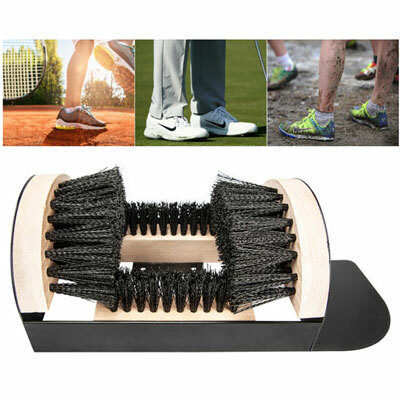 •BUILT TO LAST: Heavy duty high molded plastic brushes, weatherproof hardwood and a strong iron frame with a powder coat finish to prevent rusting in muddy, wet, snowy weather ensure that this boot brush lasts for years to come, 9¼ wide, 6" deep, 4½" high. •ALL IN ONE: This perfect cleaner with super coarse brushed on both the sides and bottom scrapes away mud, grass, sawdust, snow and other hard stuck on debris from your boots, soles, treads and edges of your shoes with causing harm and keeping the inside of your house, car, truck or workshop clean. 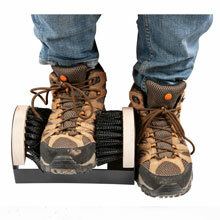 •PORTABLE OR MOUNTABLE: Easy use for all ages – one side features a folding plate to secure stationary foot in place, in wet or muddy weather or use the included four screws and anchors to bolt down for permanent placement, ideal for the home, garage, workshop, office buildings or farm. 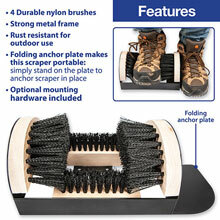 •MULTI PURPOSE: This heavy duty boot scraper is useful at any location, homes, ranches, farms, job sites, workshops, job sites, garages, patios, beach homes, hunting camps, even golf courses.